Two of the four mayoral candidates have experience in dealing with public transit issues as councillors and, in the case of Rick Goldring, as mayor. Rick has done much to promote transit through events like lectures and his support for the annual Transit Users’ Forum, and it was his administration that hired our new Transit Director. But his voting record is weak. Marianne Meed Ward has been on the losing end of too many 6-1 votes as a transit supporter. For continuing to promote transit against a wall of implacable opposition, and for her past work with BFAST, we give her our endorsement. We also give credit to Mike Wallace, whose well-thought-out positions on transportation recognize the role of transit in promoting sustainable growth and keeping the roads budget at reasonable levels. On the whole, however, Marianne has been in the trenches for better transit and deserves our support. Four candidates answered all questions in the survey very favourably from the perspective of public transit: Vince Fiorito, Kelvin Galbraith, Marty Staz and Judy Worsley. Vince Fiorito is probably the most familiar with the issue, having attended the Transit Users’ Forum and been a BFAST supporter. We endorse him with the recommendation that he be very cautious in his support for privately-owned ride-sharing services that pay no taxes to Burlington. Arlene Iantomasi commented that she expected transit, unlike roads, to pay for itself through the farebox. As this only happens in the crowded cities of Southeast Asia, we can only hope to meet with her if she is elected to demonstrate that initiatives like free fares for seniors are well worth the small investment. Despite a few non-supportive answers, every candidate in Ward 2 seems positive on transit. Three — Lisa Kearns, Gerard Shkuda and Roland Tanner — answered all of our questions in a transit-positive way. During the campaign, we’ve had meeting requests and correspondence from both Tanner and Kearns. We found them both to be excellent potential advocates for transit on Council. As a key member of BFAST since its founding, Gareth Williams has experience and knowledge on the transit file that simply cannot be matched by other candidates in the ward. He’s been a committed and active transit supporter for the past decade, We endorse him for those reasons. We note that both Lisa Cooper and Rory Nisan are also strongly pro-transit. But Gareth’s experience and knowledge gives him the edge. Shawna Stolte is the transit supporter in the Ward 4 race. She has met with BFAST on transit issues and would support pro-transit measures on Council. Incumbent Councillor Jack Dennison has a near-perfect record in voting against pro-transit measures over the past few terms. The choice for transit supporters is a simple one in this ward. It is Shawna Stolte. Once again, the incumbent’s voting record could not be classified as pro-transit. Although he did make a number of comments, Councillor Sharman would not commit to answering any questions in the survey. The ward’s other four candidates — Wendy Moraghan, Daniel Roukema, Mary Alice St. James and Xin Yi Zhang — all made strong commitments to transit. While we would be pleased to see any of these four elected, we lean towards Daniel Roukema because of his experience in community development, his youth, enthusiasm and new ideas. While incumbent Blair Lancaster provided positive responses to half of the questions on the survey, her voting record does not speak of a positive attitude towards transit. Angelo Bentivegna has researched transit and has attended BFAST meetings. We are confident he would be supportive of transit as a councillor. Seriously??? You drew these conclusions from comments and six awkwardly worded questions? BFAST used one person’s attendance at BFAST meetings to suggest they’re informed. BFAST used one person’s youth to suggest they were superior to their competitors. Might I add that every dollar that funds transit is a dollar that isn’t sent on public safety or environmental concerns? Might I add that increasing taxes is money not spent on a child’s RESP or the retirement savings of a working couple? The point is BFAST should advocate for better transit and explain their solutions where voters or government might not be knowledgeable. To weight in on who should voters throw their support behind is a public service worthy of less then zero! BfAST is a transit advocacy group so our questionnaire and our candidate endorsements are heavily weighted towards candidates’ thoughts and policies on Transit. Candidate White’s response suggests he is not a supporter of public transit and while he is absolutely entitled to that position, it is reasonable that his position would not earn him a high standing on a BfAST survey. Some municipal candidates have been very involved in the community over the years and some of that activity has been on transit issues to improve transit. It stands to reason that those more actively involved in transit score higher in the BfAST survey. He suggests that money spent on transit is money taken from safety and environmental concerns. BfAST would suggest that investment in transit benefits the environment by taking cars off the road which also improves road safety and reduces traffic congestion. Based on the preferences of electorate Municipalities allocate budgets between the many essential services they provide. We believe transit deserves a bigger share of our tax dollars. Candidate white obviously disagrees, prefering to save tax dollars for other things. The voters will decide if his views or BfAST’s positions better reflect their beliefs. BfAST will continue to advocate for access to transit for economically and physically challenged, for seniors, for students and youth and those for whom public transit is their only affordable mode of transport. Once again BFAST has drawn the wrong conclusions. To be clear, the BFAST Transit survey lacked any academic framework and to draw conclusions from a poorly written survey is faulty at best. Several other participants alluded to this. Since, BFAST has never spoken to me I’ll take this soap box to explain my views on transit as well as suggesting how the City could pay for this; something no one ever talks about! As a backgrounder, in canvassing many people I came across a person in the know who informed me that the reason the City’s Transportation Plan was so delayed was that they had gone through three different transportation consultants. I would speculate that the reason there were so many consultants terminated was that the numbers provided by the consultants were so unexpectedly high that they would have shocked the voting public and invoked the conclusion that Grow Bold was a failure. In researching similar transformative transit plans you easily draw the conclusion that a project of this magnitude would cost the City of Burlington $50M-$100M. BFAST is not thinking on this level and its own proposals clearly suggest tinkering with transit instead of meeting the future needs of the City. 1) Merge the municipal transit of Oakville, Burlington & Milton. This is a platform Doug Ford campaigned on so I would ask for money to smooth the transition costs. 2) Remove free parking passes from City employees and replace them with free transit passes. These are the people who keep approving transit encouraging density developments. I think we’d see some unexpected transit improvements and at the very least would save the City a bunch of money on employee parking. 3) Investigate and install a dedicated bus lane through the hydro cut which runs from the south west of Burlington all the way to North East Burlington and even to the Evergreen community which had it’s secondary plan approved in September. 4) The cost of providing a robust transit system would likely be in the magnitude of $50M-$100M. This is over 100% of the annual capital budget or roughly $1000 for every residential household in Burlington. I would pay for this and continued transit improvements by disgorging the spectacular profits being made by land owners inside the Mobility Hubs. The Holland Park Gardens land recently sold for a rumoured $52M. This seven acre parcel would normally have sold for $7M. Deals like this are long dated and would close over a period of five to seven years. An agreement for profit sharing could be had if the City was prepared to convert the land to employment lands. 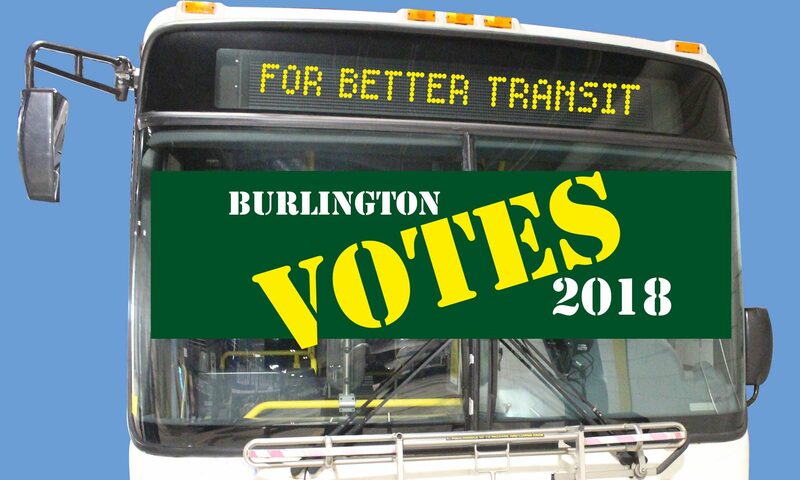 The threat of changing the zoning would motivate the land owner to negotiate terms and in turn provide the City with necessary funding for transit that would properly service Burlington. There are many pieces of land inside Mobility Hubs being assembled. I feel strongly that no organization should endorse any candidate. Decisions should be made by residents listening to the candidates and forming their own opinions.